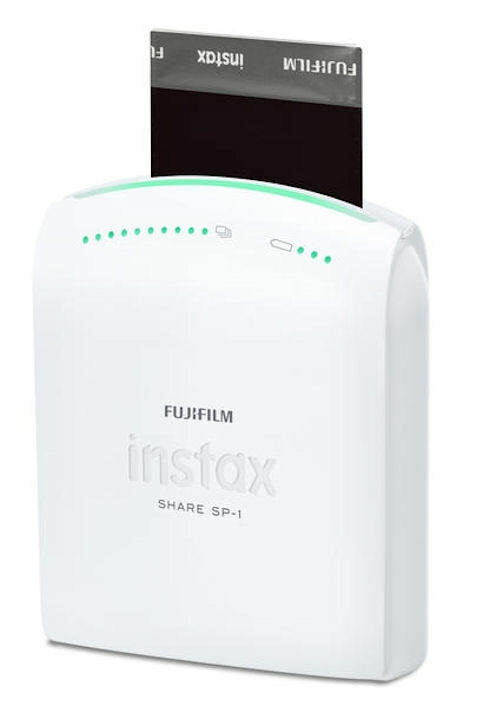 Fujifilm has introduced a new portable photoprinter Instax Share SP-1. It allows to use iPhone as once popular Polaroid cameras—to make a shot and print it right away. The printer is compact in size, and its photos are a little bit smaller than that of a Polariod—62 x 46 mm against 78 x 79 mm. Wi-Fi is used to connect the device. To make everything work, it’s necessary to download Instax Share App on the smartphone or tablet (it is available for iOS and Android). For the convenience of users, there is a button on the printer, which allows to make as many copies of a photo as needed. If desired, it’s possible to add a date and an hour on the printout and even the GPS-coordinates of the place, where it was taken. Fujifilm Instax Share SP-1 is operated from a battery, which power capacity is enough to make 100 shots. According to the manufacturer, this special printer will enter the market in April 2014. Its approximate price is planned to be rather high—about $200 (70 cents per photo). This entry was posted on Thursday, January 9th, 2014 at 11:04 am	and is filed under mobile, printing. "What 2013 Has Brought Us"
"New Generation of Sharp MFPs: MX-5141N, MX-5140N, MX-4141N and MX-4140N"